The client is based out of Belgium and was looking to create 360 Degree Wedding Video with the live wedding footage. Since there are very few companies which can provide this kind of service, the client approached us after checking our portfolio of videos we had executed, and decided to work with us. The client shared over 8 hour video footage which was shot in 360 degrees. The whole narrative in terms of the final video was to be edited to just one hour. Though we have executed several videos for real estate and other clients, O2I did face a few challenges during this project. It required us to research, understand and then execute the job. Since this was the first 360 Degree Video that we were executing, we wanted to have a proper understanding of the sequence of events before stitching it together. Further we also had to integrate the video, sound, and music together which is a slightly different process while editing a wedding video. In addition to this, a specific software was required for the job, which we had to purchase. With prior experience and familiarity of virtual tours executed for real estate and weddings, we were able to edit this video comfortably. Our team underwent proper training along with a lot of research, learning, and understanding of the new software before executing the job. For proper video sequencing, entire video footage had to be ripped into a regular format to eliminate the unwanted footage. Also, to maintain sequence and stitching the video back together required special attention from the video editors. After placing video in the desired sequence, mixing live audio along with music, video, and sound was the next step before stitching the final video to create a 360 Degree Wedding video. To execute this job we used the latest software Autopano and VideoPro. While this was the first time O2I executed a 360 degree Wedding video the client was highly satisfied with the work. Outsource2india handled the project by employing some of our best editors for the job. It was a thorough learning experience for team O2I and since there are very few service providers offering 360 Degree Wedding Video Services, we can claim that we are one of the pioneers in this field and after the successful execution of this project - we look forward to engaging with clients worldwide on more 360 Degree Wedding Video projects. 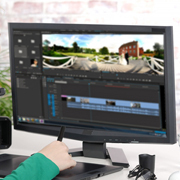 There are hardly any companies who have the capability to successfully deliver 360 degree video editing services; that too at a faster turnaround time and within affordable prices. The professionalism, efficiency, and timeliness of the O2I's vide editors won over the client. Outsource2india is one of the leading creative design service providers in India offering a wide range of video editing services including 360 Degree Video Editing, and has the capability, infrastructure and know-how to offer bespoke services to satisfaction. If you have a similar or unique requirement, contact our team today, we will be glad to provide you a customized solution.